For this post, I'm baking two kinds of pizzas with my two baking friends, Lena, from Frozen wings and Joyce from Kitchen Flavours for our Pizza Nite-In bake-along theme. Please visit their blogs for their great pizza ideas. Like most pizza lovers, my family and I usually eat pizza made with tomato base, top generously with mozzarella cheese. For a slight twist, there is no tomato used in Pizza no. 1. Instead, an Italian cheese, Taleggio is used as a major topping for this pizza. When I had my first sniff on Taleggio, being freshly bought from the market, I was afraid that my family wouldn't like this cheese because of its strong aroma. In contrast, the baked version of Taleggio on our pizza has a very mild flavour with an unusual fruity tang that makes our pizza extra delicious. What's next? Dessert, of course! For Pizza no. 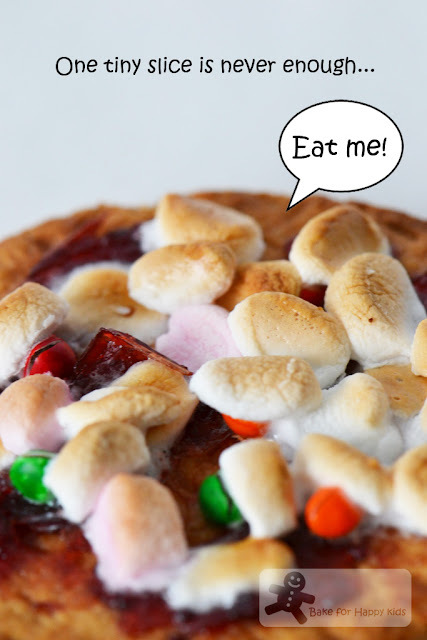 2, I've created an easy, sweet and kiddy version of pizza using digestive biscuit as my pizza base and lots of lollies and marshmallows as my pizza toppings. No doubt that these "pizzas" are extra-yummy especially when the marshmallow toppings are freshly toasted! One slice is never enough...just eat the whole lot! 1. Dissolve yeast and sugar in lukewarm water. Stand for 10 min or until frothy. 2. Sift flour and salt onto a clean work surface to form a mound. make a well in center and pour in yeast mixture. Using hands, mix until well combined. Knead for 5 mins, until smooth and elastic. Roll dough into a ball. prevent a crust forming. Cover with a clean tea towel and stand in a warm place for 2-3 hrs, until doubled in size. Divide dough into 4 portions. Roll each into a ball. 1. Preheat oven to 200°C fan forced. Brush a 30 cm pizza tray with extra oil. 2. Place potato slices in a baking dish. Drizzle over oil and toss to combine. Bake for 15 min or until potato is just tender. fingertips to form a 5 mm-thick round with a slightly thicker edge to prevent topping running off. Place on prepared tray. 4. Scatter over mozzarella, leaving a 2cm border. Top with Taleggio cheese and potato slices, then scatter over garlic (I didn't add any garlic into my pizza). Season with salt. Bake for 15 min, until base is crisp and golden and potato is cooked through. Season with pepper, cut into wedges and serve. Use Digestive biscuits or any equivalent kind of sweet crackers or biscuits such as Graham crackers or Marie biscuits as pizza bases. Spread 1/2-1tbsp of berry jam onto each base. Amount of jam vary depending on individual taste and size of the biscuits or crackers. Sprinkle the lollies or chocolate chips (roughly chopped or miniature size) onto the base as desired and top with generous amount of roughly chopped marshmallows. Lightly toast pizza with only top heating in the oven for 3-5 min. Remove them from the oven when the marshmallows turn golden brown. What a great pizza! I had a potato pizza a year or so ago at the Mellow Mushroom and it was AMAZING! I bet this one was, too! I was just at Frozen Wings blog looking at her potato pizza! And you lolly pizza is so creative. we got the same idea, i baked a potato pizza too! i really like the look of the thin slices of the potatoes, you have arranged them beautifully! the marshmallow pizza is so cute, they look like little mushrooms sitting on a garden! Hi Zoe, I've never heard of Taleggio cheese! It looks good with the potatoes! And the Lolly Pizza is a 'cool' idea! I can just imagine a bite into the warm "melted marshmallows"! My kids would love these! The potato pizza looks great! I haven't tried it before, but now I must! Interesting topping, looks so good and delicious. 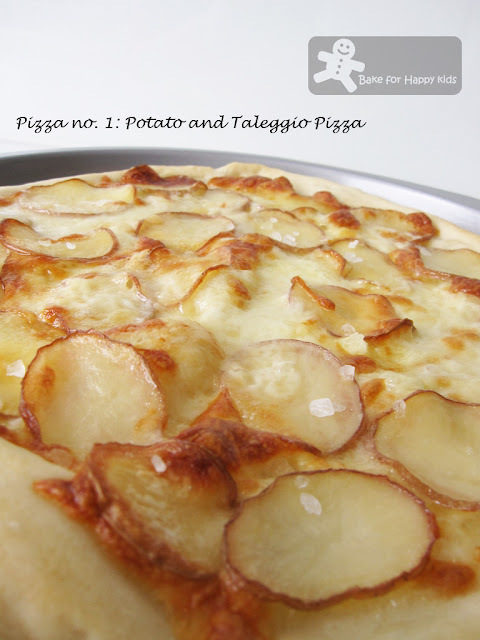 Never had potato pizza,looks Yummy and I'm sure these taleggio cheese make taste great,,.i never had these cheese. Zoe, thank you SO much for your detailed explanation on the flour ratio in your previous post...so very much appreciate it :)) you really know your flours! ive always seen recipes using italian 00 (eg when makng pasta) but had no idea what the difference is!! oh ive recently got my bread machine out again (after a long time gathering dust on the floor) and used it to make pizza too :P (this potato taleggio looks soo gourmet!) i am trying your bread roll this weekend...i really cant wait! :) have a lovely weekend ahead! Great minds think alike?? Both your pizza and Lena's look yummilicious! I wanna try this out someday. And the lolly will be a sure winner with kids! 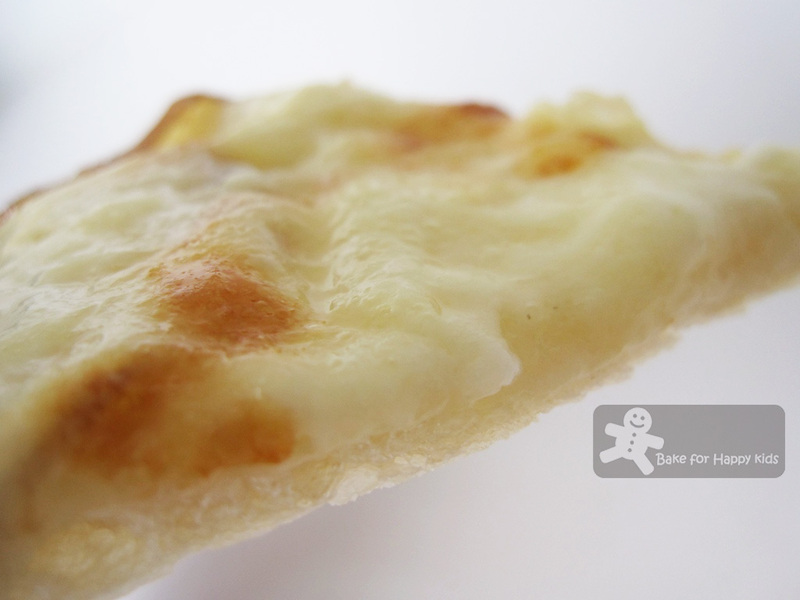 What could be more comforting, potato, cheese all rolled up into a pizza - delicious! you are so creative, this pizza must be very good! you are so creative, your pizza look so good and tempting! Omg, both pizzas looks extremely comforting and inviting.. I love both of your pizzas,especially the lolly pizza!yum yum! Zoe, I want to have all the pizzas from you, Lena and Joyce. Look very delicious and I'm getting hungry now! 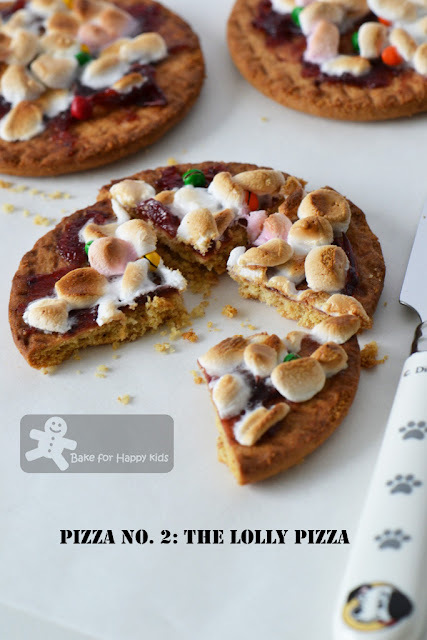 OK, I am definitely making those cute lolly pizzas with my son this weekend!!! They are adorable! What a brilliant concept, thank you! Oh the pizzas look great! Potato pizza... nice! Just visited lena's blog and she has potato pizza too! Yours looks as delicious and I love the look of that Lolly pizza too! Sounds like a great flavor combinations..
Love it with thin potato slices on top, yumm! Your Lolly pizza is amazing! I can understand why one piece is not enough. I want the whole pizza! That lollypizza looks so very tempting! I love, love pizza! All of them look terrific!